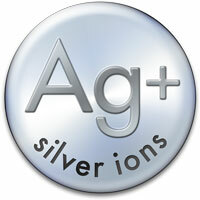 Known for many years, silver is a natural antimicrobial element. It releases ions to eliminate bacteria and fungi. ﻿Barrington Healthcare is using coated textiles with silver ions for all its “Vigilance” covers. Appearance, texture, fire safety, and all other technical features remain unaltered. Unlike Triclosan, Ag+ Silver Ions treatment (also known as nano-technology) does not wash out, helping to protect the environment from chemical pollution.